My friend’s Facebook post was all smiley faces and exclamation points. She had spotted one of her favorite rockers across a crowded eatery in Aliso Viejo and posted a stealth photo as proof. The grainy, zoomed-in shot showed Def Leppard guitarist Phil Collen going incognito, wearing guy-next-door clothes and clutching a fork instead of a guitar. Still, her fan-forever heart had recognized him. In the category of crushes, I go old school, preferring to moon over the iconic Puppy Lover himself: Donny Osmond. Blame puberty. At age 12, my best friend, Debbie Smith (also under the influence of hormones), proudly showed off her bedroom papered with Donny posters, not an inch of blank wall peeking through. I stared in wonder at the kaleidoscope of warm brown eyes just like mine, the generous smile aimed right at me. I was hooked. Soon after, I grabbed as many Tiger Beat magazines as my weekly allowance could buy and started making my room into a Donny shrine. Mom and Dad stood on the sidelines, shaking their heads, for this was the day their baby girl discovered boys weren’t icky. Later that year, my dad took me to see The Osmonds at the original MGM Grand hotel in Las Vegas. All the brothers were onstage that night, but I only saw my young heartthrob, certain our stars would align one day. Right after high school, I married a man I thought looked a little like Donny in that distant-cousin kind of way. We made it nearly 11 tumultuous years before he turned out to be (forgive me) one bad apple. My second husband was a much better pick. He proposed after only nine dates, a bold move that bespoke his crazy-crush heart for me. 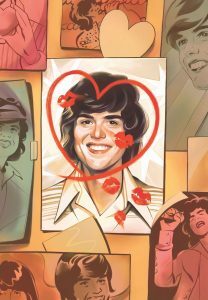 Not long after we got married, we settled in Lake Forest—less than 10 miles away, I later learned, from where Mr. and Mrs. Donny Osmond and their growing family had once set up house in Irvine. That I was happily married didn’t stop me from considering it a sign. Fast-forward a few years. I’d started writing for local magazines and had netted an interview with “Dancing with the Stars” pro Cheryl Burke. Cool. But when her publicist asked if I wanted to attend a live taping as part of my research, the full heady implications hit me. This was the same season when you-know-who was one of the celebrity dancers. I took forever to get ready that night. In my mind, attending that taping was akin to a first date. Surely my favorite teen idol would spot me in the studio audience and know I’m the one who got away, despite the fact we’d never met. At least that was the hopeful plan. Instead, when Donny and his pro partner waited at the edge of the dance floor as their rehearsal video played overhead, several other brazen women suddenly shouted his name. They just yelled it out, never mind my trying to cast a Jedi mind-spell on him to turn his gaze my way. When he flashed his signature grin and waved in their direction, I jumped up with both arms high, shouting “Don-ny!” Jackpot. He looked right at me, waving both arms in sync with mine. The second sign. And that’s when Donald Clark Osmond did something that stopped my heart entirely. Without missing a beat, he casually stepped down a short stack of conveniently placed stairs to come offstage and into our realm. He shook hands with the screaming front-rowers while I tried not to faint. Michael encouraged me to stand up and get in there, and I did, suddenly a gushing age 12 again, holding my breath until my dream guy was within target range. Then I leaned forward and pushed through to the action zone. The motion caught his eye. His hand reached for mine until … touchdown! He squeezed it. I squeezed back. His caressing gaze locked onto mine, and I saw in that dizzy, frozen-in-time moment, he knew. He knew that if it hadn’t been for his marriage, my marriage, his five kids, my two cats, and the fact that I wasn’t Mormon, I would be The One. his, and I was reminded that this tangible, touchable reality is even better than fantasy. A few years ago, I saw Donny again at the Cerritos Performing Arts Center. This time, I was singing along to the old favorites from a balcony seat, making me geographically undesirable, but that was OK. We’d always have Pechanga. And the MGM Grand when I was 12. No coincidence that Donny and Marie have a long-running show at the Flamingo these days. Because, did I mention? Las Vegas is my hometown. Another sign.